In a dominating final table performance Dmitry Gromov, who entered the eight player final table as the chip-leader, led wire to wire at the inaugural World Poker Tour (WPT) Vienna. 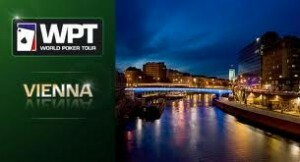 Not only was the tournament the largest WPT tournament to take place in Europe –with 555 participants—but it was also the first WPT tournament that was broadcast live on the Party Poker website via a live stream. Gromov was dominant throughout, never relinquishing his chip-lead, and never in serious jeopardy at the final table. The most experienced player at the final table, and arguably one of poker’s hottest players at the moment, Alessio Isaia was eliminated early on, leaving the remaining players breathing a collective sigh of relief. As players were eliminated one by one Gromov found himself pitted against fellow countrymen Maxim Kosolv, but after just eight hands Gromov would raise his hands in victory as his AT outraced Kosolov’s pocket 8’s, giving him the title and his biggest tournament score to date, a €447,840 payday. This entry was posted on Wednesday, March 30th, 2011 at 12:03 pm and is filed under Poker News. You can follow any responses to this entry through the RSS 2.0 feed. You can leave a response, or trackback from your own site.